Indonesian Idol, the most popular singing competition in Indonesia, is back to indulge its loyal viewers all around the country with exciting and inspiring performances from undiscovered talents. 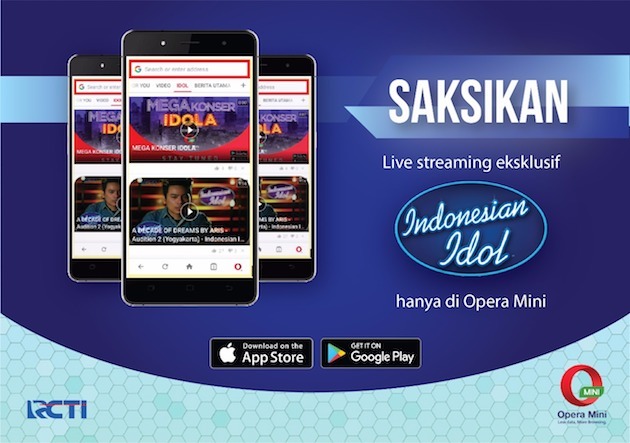 For its ninth season, Indonesian Idol is collaborating with the leading mobile browser application, Opera Mini, to give viewers exclusive content access to watch and follow closely with updates from their favorite reality TV competition. Powered by Opera Mini’s built-in AI newsfeed engine, fans can now watch Indonesian Idol conveniently from their mobile devices. “Indonesians, especially the millennials, are spending more time on mobile devices. This partnership with Indonesian Idol will allow fans to enjoy their favorite show anywhere and anytime through IdolbyOpera.com via Opera Mini browser by discovering and delivering more untold stories to our users. This is the type of special content we would like to give access to Opera Mini users in Indonesia,” explained Jorgen Arnesen, Global Head of Marketing & Distribution, Opera Software AS. To enjoy more Indonesian Idol with less data, fans can install the Opera Mini browser and click on the IDOL channel. The first episode of the new Indonesian Idol will be streaming on Opera Mini beginning at 20:00 on December 18, 2017. Additionally, fans can also access hours of never-before-seen exclusive content, such as pre-elimination videos, bloopers, reaction videos, compilations as well as backstage sneak peeks, all only on the Opera Mini browser. Indonesian Idol Season 9 will bring a new set of judges to spice up the competition. Five talented musicians will be the judges for this season- including Maia Estianty, Armand Maulana, Season 2 runner-up Judika, Ari Lasso and Bunga Citra Lestari – who will shape the all new and fresh contestants into the next Indonesian Idol.